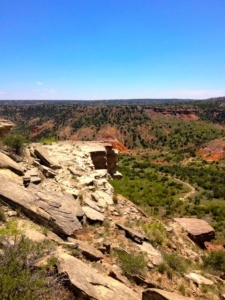 Palo Duro Canyon is approximately 120 miles long and 800 feet at its deepest point. 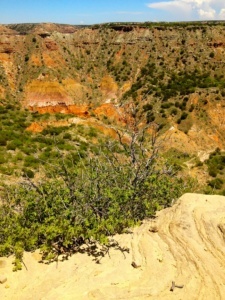 It is the second largest canyon in all of the United States. 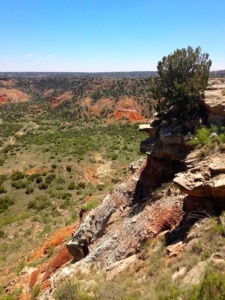 “Palo Duro” is a Spanish word meaning “hard wood“. 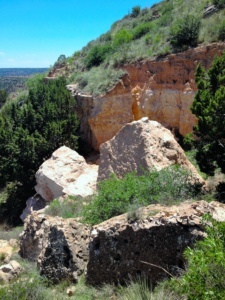 As I began a short descent down the rocky trail it became abundantly clear as to why the Palo Duro Canyon received such a name. 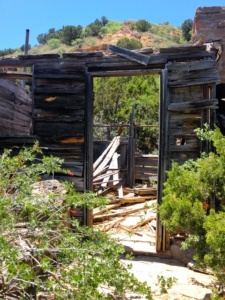 Junipers, mesquite, cottonwood, cedar, and other hardwoods sprang up from the walls and floors of the canyon in common form. 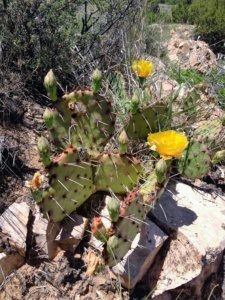 Wildflowers, buffalo grasses, sage brush, yucca, and prickly pear cactus also dotted the panoramic landscape offering an array of splendid colors. 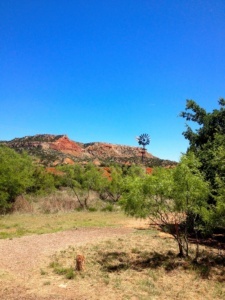 “Palo Duro” is a Spanish word meaning “hard wood“. The official motto of the Boy Scouts is “Be Prepared”. 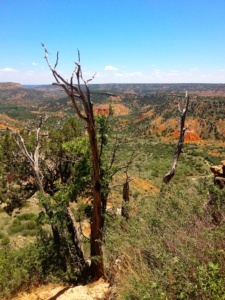 Unfortunately, I never made it past the Cub Scouts so I found myself at Palo Duro Canyon being ill-prepared with not a drop of water at hand . 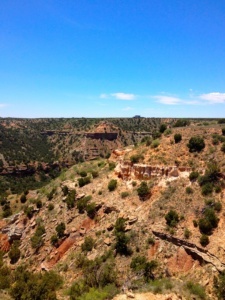 With the rugged terrain and the unforgiving Texas heat bearing down on me, my exploring was limited to a 30-minute hike in any direction from where I chose to park my car. I followed the rule “look but don’t touch” when I found these beauties along my path. 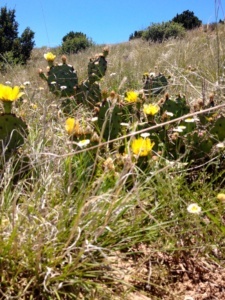 I’ll leave the handling of these pretty flowers to the porcupine! 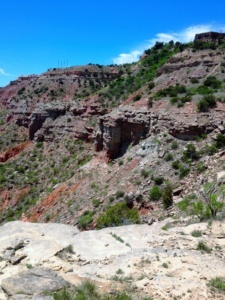 I’m not completely certain there were any porcupine around, but Palo Duro Canyon is home to various forms of wildlife to include mule deer, wild turkey, roadrunners, horned lizard, coyotes, bobcat, barbary sheep, cottontail rabbits, hawks, bald eagles… and did I mention snakes? 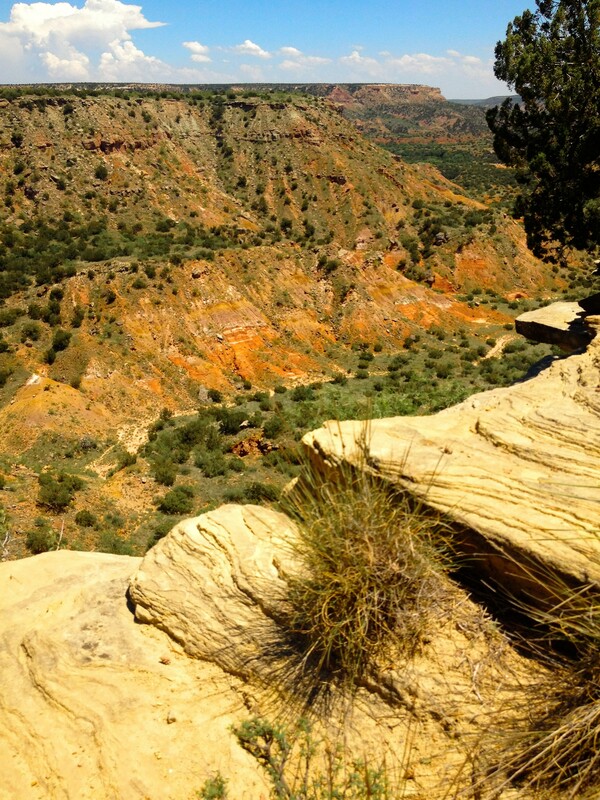 Not just your run-of-the-mill gardener either, Palo Duro Canyon is no stranger to the diamond-back rattler snake. I’d be lying if I said I wasn’t just a wee bit apprehensive with every step through the shrubbery and thistle. Shhh! I just heard something rattling close by! 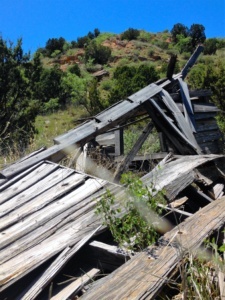 I hadn’t traveled far when I came across this dilapidated structure. It was but a record of bygone days when Indian warriors and cattle baron came into conflict on the open plains. 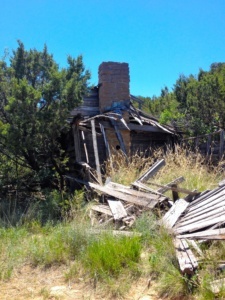 If these walls could talk they might spin countless hours of tales concerning cowboys and Indians on the Texas Panhandle. Since I didn’t have countless hours to remain idle, and since talking wooden planks is undoubtedly the first warning sign of heat exhaustion and dehydration, I figured I best mosey on. Ain’t nothing a handful of nails and a few boxes of shingles can’t fix. Anybody know if there’s a Lowes or Home Depot close by? 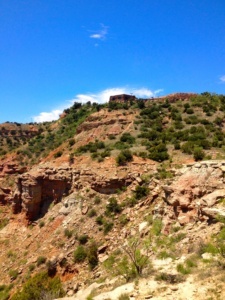 For lovers of Old West history, there is probably no better place to visit than Palo Duro Canyon. 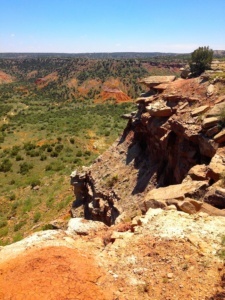 In the early dawn hours of September 28, 1874, the 4th U.S. Calvary, led by Colonel Ranald S. Mackenzie, zigzagged their way down onto the canyon floor to surprise five encampments of Comanche, Kiowa, and Cheyenne warriors. In the panic that ensued, the tribesmen found themselves terribly outnumbered and outgunned. Although only 4 Indians were killed, the cavalry captured 1,400 of their horse and burned all of their teepees and winter stores. Colonel Mackenzie kept only 300 of the horses for his men and ordered that the remaining animals be shot to avoid being reclaimed by the warriors. Without any horses and winter provisions, the Indians were forced to return by foot to their reservations near Fort Sill, Oklahoma to escape starvation. 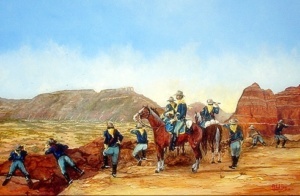 This skirmish, known as the Battle of Palo Duro, was the decisive battle of the Red River War (Buffalo War, 1875-1875). This battle also sealed the fate of the Plains Indian, ensuring a life on the hunt was forever a thing of the past. Soldiers of the U.S. 4th Calvary survey the ground below as they prepare their attack. 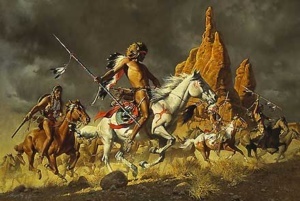 Cheyenne warriors ride into battle. With the Southern Plains tribes all removed to reservations, the end of the Red River War paved the way for land settlement in the region. 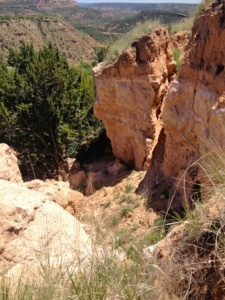 From 1876 to 1890, most of the canyon became part of the JA Ranch that was owned and operated by Col. Charles Goodnight. Prior to cattle-ranching, Goodnight served as a Texas Ranger and was a veteran of the American Civil War. 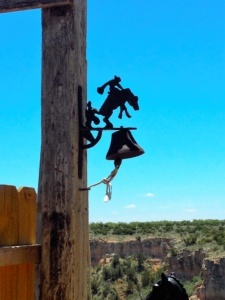 After the war between the states, Goodnight teamed up with Oliver Loving and grew to cowboy fame blazing trails from North Central Texas, up the Pecos River, through New Mexico and parts of Colorado. 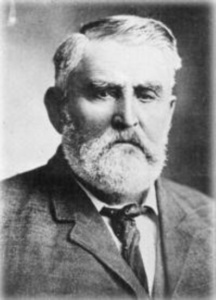 From 1866 to 1871, he and John Chisum drove thousands of cattle through the New Mexico area. 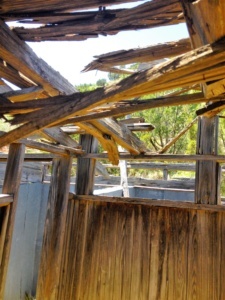 By 1885, the JA Ranch became one of the largest in existence with over 1,325,ooo acres and 100,000 head of cattle. 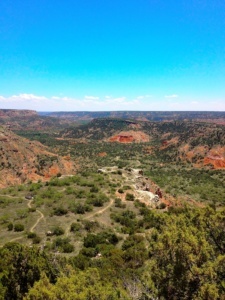 In the fall of 1878, Comanche Chief Quanah Parker left his reservation near Fort Sill and led a large group of Comanche and Kiowa to their former hunting ground at Palo Duro Canyon. Upon arrival, they were disappointed and angered to find the buffalo were gone and had all been replaced by Goodnight’s cattle. Perhaps out of both hunger and retaliation, the tribesmen immediately began slaughtering the JA cattle. Desperate to save his cattle and seeing no other alternative, Goodnight rode out to the Indian encampment to seek out a resolution and compromise to the problem. In the days that followed, Goodnight hashed out an agreement with Parker that he would provide his people two heads of cattle per day until more buffalo could be found. The treaty comprised by the two remained in place until Quanah Parker eventually returned his group back to the reservation. 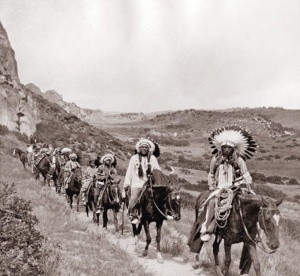 Native Americans embark on a remembrance ride through Palo Duro Canyon some years after the war. 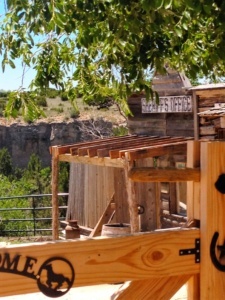 Palo Canyon State Park offers its visitors 18,438 acres of activities and amenities to include complete access to the canyon floor, camping, hiking & riding trails, cabins, shelters, a visitor center, camp store, and more. Has anybody seen my car? Things really are bigger in Texas! Would you look at that amazing view! 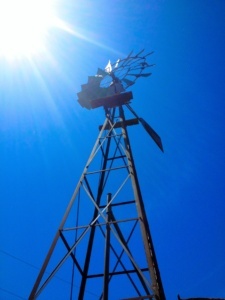 The Aermotor Windmill Company was started in 1888. 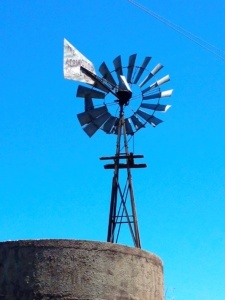 It remains to this day the only active windmill company in all of the United States. 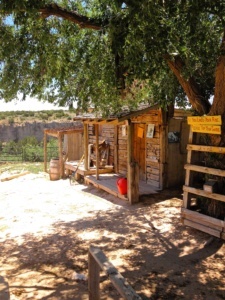 The Palo Duro Canyon visitor center (situated above) contains a museum and gift shop. What’s that I see? It looks like dehydration and a potential heat stroke brooding on the horizon. I think it’s time to hit the trail… and by hitting the trail I mean getting inside my car and driving someplace where I buy a cold drink. Not far off the beaten path, I rode up to these riding stables and just had to make a quick stop. Now this place looks a lot like Texas, fellas! Maybe the next time I pass on through I can “cowboy up” and go out for a ride. The place actually appears to be deserted for the moment. Maybe the sheriff is just out to lunch. They might not take kindly to strangers poking about. I had better saddle up…. By saddling up I’m referring to sticking my key in the ignition and driving away. 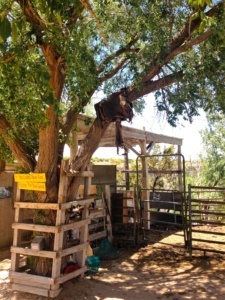 The Palo Duro Riding Stables are a family-owned business that’s been in operation since 1962. 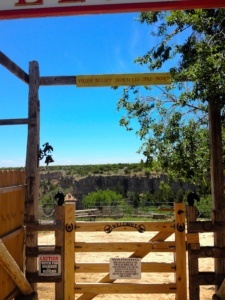 These stables offer riders a unique canyon experience that can only be accessed on the back of a horse. Well, it’s about that time for a little refreshment and relaxation. I’m off to Amarillo for a Texas-sized Shiner Bock straight from the draught. Now, if I can just get Siri to point me to the nearest saloon and I’ll be on my way. 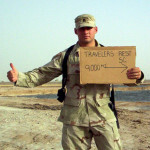 After that, who knows where the road might lead me. There’s still a whole lot of Texas to see and I’ve still got plenty of gas. I hope you’ll join me along the way. 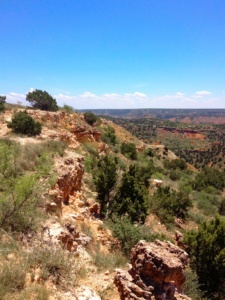 Maybe we’ll meet up on Route 66 or somewhere off that old dusty Chisolm Trail. If you do decide to tag along, remember no singing. We’ll leave that one for the real cowboys like Roy Rogers and Gene Autry. It just doesn’t have the same feel to it when you’re not actually riding a horse.